NYC, 04/18/2019, 4:00PM. 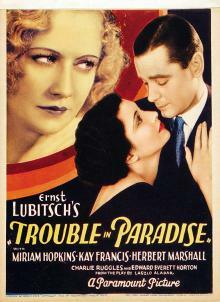 Trouble in Paradise (1932): Thief And Pickpocket Join Forces. A gentleman thief and a lady pickpocket join forces to con a beautiful perfume company owner. Romantic entanglements and jealousies confuse the scheme. 83 min. Director: Ernst Lubitsch. Starring Miriam Hopkins, Kay Francis, Herbert Marshall. Based on the 1931 play The Honest Finder by Hungarian playwright László Aladár. In 1991, Trouble in Paradise was selected for preservation by the United States National Film Registry by the Library of Congress as being "culturally, historically, or aesthetically significant". The movie was named by the National Board of Review as one of the top 10 films of 1932.